Kathak means a school of dance. It is also a name of community of dancers. The word sound simple. But it has a history which throws much light on the position of classical dance in North India. The word Kathak is etymologically related to Katha- the art of story- telling. According to some authentic Sanskrit lexicons Katha means composition of a literary piece. Katha as narration was then a distinct form of composition intended for use by rhapsodists and reciters. 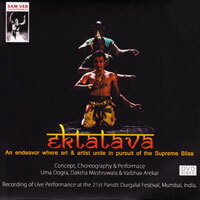 As such it had music and dance, with abhinaya, among the features of its technique. Knowledge was thus, conveyed to the people in a vivid and entertaining manners. The Kathakas have been known through centuries as a community of dancers and musicians. It is, therefore, not unlikely that their dance recital came to be styled as Kathak by virtue of its association with this community. 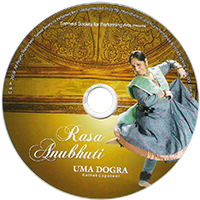 The kathak dance has in it all the classical elements such as Nritta, Nritya and Natya. The erroneous view held by some that it has no Abhinaya is refuted by the wide range of Bhawa Darshana. In the language of Kathak, Abhinaya is known by the similar word Bhawa. The foot work in Kathak is often appreciated almost to the exclusion of its other features. The foot movement is implicit in the conception of the art of dance. 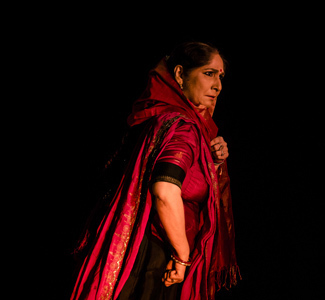 The Kathak dance has simply emphasized the beauty of foot work as an unequal part of the classical dance technique. It has not overdone the foot movement.In style and form, the Kathak dance is different from the other styles and forms, but it derives, equally with them, its authority from the Natya Shastra. Kathaks were originally a caste of story-tellers and rhapsodists who were attached to temples in certain regions of North India. The next stage in the evolution of Kathak as a distinct mode of dance came in the 15th and 16th centuries A.D. when, with the popularization of the Radha-Krishna legend and the consequent emergence of the cult of prem bhakti, or devotion through love, a form of operatic play known as Rasa Lila came into existence. With the advent of Muslim Rule, the Kathak dance was taken from the temple to the court, and thenceforward it developed in two different milieus, one represented by the Hindu courts of Rajasthan, particularly the court of Jaipur, and the other by the Muslim courts of Delhi, Agra and Lucknow. Under court patronage Kathak transformed itself into a highly technical and stylized art for the delectation of the few. In both Hindu and Muslim courts, Kathak came to be regarded as a sophisticated form of entertainment, with the emphasis almost entirely on the solo performer. In Rajasthan the nritta aspect of the dance received much importance, and this resulted in making the Kathak there mostly a matter of rhythmic pyrotechnics. The Muslim patrons, on the other hand, had no more patience with mere technical virtuosity, however dazzling it might be. Hence the kathak, which blossomed under their aegis began to lay greater stress on nritya and bhava, and eventually, came to be characterized as a dance, which was graceful and decorative. The Jaipur gharana has many branches of lineages. Bhanuji, one of the early figures of the Jaipur Gharana lineage, being a devotee of Shiva, was well-known for his rendition of the Shiva Tandava. However it is commonly believed that Bhanuji’s grandson, Kanuji was influenced by the Bhakti Movement. Kanuji’s grandsons were Hari Prasad and Hunuman Prasad, the stalwarts of this gharana. The latter’s rendering of bhajans (devotional verses) is legendary.They became dancers in the Gunijan-Khana (abode of the experts) of the Jaipur Court. The sons of Hanuman Prasad – Mohanlal, Chiranjilal and Narayan Prasad – were considered great dancers of their time. In a parallel development, their cousins, Jailal and Sunder Prasad, sons of Chunnilal, also left an indelible stamp of their greatness as dancers, the former having died young but the latter living long enough to many coveted awards. With Vaishnav influence on other branches of the family, Krishna themes became equally important. The khiskan and the kasak-masak in Thaat, alongwith complexities of rhythmic patterns became the hallmark of this gharana from Rajasthan, which slowly came to be known as the Jaipur Gharana, after a meeting of the Kathaks in 1895, when it was decided that henceforth, the gharanas would be named after a place instead of families or individuals. As mentioned before, the Jaipur Gharana is famous for its layakari, or rhythmic wizardry. The masters of this gharana were all adept tabla and pakhavaj players. Speed and rhythmic challenge became the primary concern of the Kathak dancer of this gharana, to a point where often these far overshadowed grace of movement. Despite this stress on an incredibly fast, complicated and competitive style of pure dance, the Jaipur Gharana nurtured an important ang or part of the Kathak narrative tradition – the kavit-toda. This is poetry recited in a stylized chant, interspersed with rhythmic patterns of drum beats.